The article examines the individual decision to vote or to abstain in the 2014 European elections in seven Member States of the EU. We focus on the role of socio-demographic characteristics and attitudinal factors. The empirical analysis draws upon the Comparative EU Election Dataset with 22 000 observations. The main finding is that the explanatory factors that account for participation in European elections hardly differ from those that explain participation in national electoral contests. One difference pertains to the existence of a slight gender gap in the European elections. We also find that European identity favours electoral participation while the perceived performance of the EU exerts no effect. Last but not least, there are no systematic cross-country differences in the determinants of individual turnout between the “North” and the “South”, or the original and more recent EU Member States. Le présent article interroge la décision individuelle de voter ou de s’abstenir aux élections européennes de 2014 dans sept pays membres de l’UE. Nous nous focalisons sur le rôle des caractéristiques démographiques et des attitudes. L’analyse empirique s’appuie sur les données du Comparative European Union Election Dataset qui comporte 22 000 observations. Nous démontrons que les facteurs qui expliquent la participation aux élections européennes diffèrent à peine de ceux qui expliquent la participation aux élections nationales. Une différence tient à l’existence d’un écart entre hommes et femmes dans la participation aux européennes. Nous trouvons également que l’affirmation d’une identité européenne favorise la participation tandis que la performance de l’UE, telle que perçue par les répondants, n’a pas d’impact. Enfin, il n’y a pas de différences dans les déterminants du vote entre le « Nord » et le « Sud » ou entre les pays membres fondateurs et ceux qui ont adhéré plus récemment. 1The 2014 European elections were exceptional in at least three respects. It were the first to be held according to the rules laid down in the Lisbon Treaty, the first that followed the worst financial and economic crisis since 1929 and, finally, the first in which most major European political forces declared a candidate for the presidency of the European Commission (the Spitzenkandidat). Yet, those who hoped that this exceptionality would boost citizens’ electoral zeal and counter the long-term downwards turnout trend that had characterized the European elections since 1979 could be nothing but disappointed. The final turnout rate decreased by an additional 0.5 percentage point when compared to the previous election of 2009 and reached an all-time low of 42.5%, far below the voter turnout average in legislative elections held in established democracies (74%, see Blais, 2007, p.624). This low voting rate, combined with the supranational nature of the contest, raises questions about the determinants of turnout. What are the social and political mechanisms that drive electoral participation in the European elections? Are they the same as in national elections or are they specific? 2In this article we examine the individual decision to vote or abstain in the 2014 European elections in seven countries: France, Germany, Italy, Spain, Austria, Greece, and Portugal. We look at the impact of two sets of variables: socio-demographic characteristics and attitudinal factors. With respect to the former we focus on the impact of age, gender, and education. With respect to the latter, we consider two sets of attitudes. The first is the level of interest in politics, a general attitude that indicates the degree of psychological engagement, which should predispose people to participate in any election. The second set comprises two attitudes that are specific to the European election, that is, individuals’ identification (or lack of it) with the European Union on the one hand and their assessment of the performance of the European Union on the other hand. 3We have three main objectives in this study. The first is to estimate the specific overall impact of each of these variables in the combined data set, as such and relative to each other. The second is to determine the extent to which the patterns do or do not vary across countries, and more specifically whether the determinants of turnout vary depending on the age of democracy, the amount of time since the country joined the EU, or the severity of the economic crisis. The third, as mentioned above, is to specify whether the determinants of turnout are different in a supra-national election, compared to “first-order” national elections. We should add that such a comparison will not be as systematic as we would wish, since we do not possess comparable data for the decision to vote or abstain in national elections. We will rather indicate to what extent our findings seem to replicate or not those that have been reported in previous research, which has mostly focused on participation in national elections. 4We use the Comparative EU Election data set, with about 4 000 respondents in France, Germany, Italy, Spain, and Austria, and 1 000 in Greece and Portugal. The total sample is about 22 000. The median reported turnout in these seven countries is 65%, the highest being in Greece (83%) and the lowest in Portugal (55%)1. Reported turnout is about 20 percentage points higher than the official turnout, the gap being due first and foremost to the fact that those least interested in politics and most likely to abstain are least likely to respond to political surveys and secondly to some abstainers not willing to admit they had not voted (Blais, 2000, chapter 2). Interestingly, the gap between the reported and the actual turnout is basically the same in all seven countries, ranging from 19 to 23 points. 5We move in two steps, starting with socio-demographic characteristics and then moving to consider attitudinal variables. In each case, we focus on a parsimonious set of three variables of particular interest. Concerning socio-demographic characteristics, we consider age, education, and gender. Age and education usually emerge as the two most powerful socio-economic variables when it comes to predicting turnout (Blais, 2000; Nevitte et al., 2009). The relationship between age and turnout is usually construed to be curvilinear, that is, turnout increases with age until between 60 and 70, and then declines, possibly because of greater isolation and illness (Wolfinger and Rosenstone, 1980; Bhatti et al., 2012)2. We should note that the impact of age may reflect two distinct effects, generational and life-cycle (Blais et al., 2004), which we will not be able to sort out in this study, because of the cross-sectional nature of the data set. As for education, we will simply contrast those with low and high education, the latter being those with a post-secondary education. Education is usually the second strongest predictor of turnout (among SES variables), though there is doubt about whether this reflects the impact of schooling as such or simply the effect of prior cognitive abilities (see Persson, 2014). At the same time, however, the educational gap varies immensely across countries (Gallego, 2015). It will be interesting to see whether the same pattern applies in European elections. 6We also include gender. There used to be a substantial gender gap in turnout, women being more likely to abstain but that gap has more or less disappeared in most countries (Norris, 2002). At the same time, however, women seem to be less inclined to vote in European elections (Soderlund et al., 2011). We will determine whether we observe the same pattern in our data set. 7In a second step, we explore the role of three political attitudes: political interest, political identity, and evaluations of the EU. Political interest is perhaps the most obvious motivation for voting. Following Brady et al.’s (1995) apt characterization, people participate because they want to, they are able to, and/or they are asked to. This psychological predisposition, sometime called psychological engagement, is often equated with the level of interest in politics. When one likes politics one wants to participate, and the most obvious political act is voting. This is our first basic attitude, which refers to the initial willingness to participate in any election3. 8But we are dealing here with the decision to vote or not in a European election, and that decision should also depend on how one feels about Europe. We expect those who have a strong attachment to Europe to be more prone to vote in a European election and conversely those who feel indifferent or perhaps even hostile to be inclined to stay home4. In the same manner, those who perceived the EU to be a useful institution should be more prone to participate in the election of its Parliament than those who are sceptical or even convinced it is incompetent and/or harmful5. 9Our task will be to gauge the relative impact of these three attitudes, to ascertain whether their impact varies across the seven countries, and to explore interaction effects between them. 10Table 1 shows the relationship between age, gender, and education and reported turnout, in the pooled data set and in each of the seven countries. We should point out that we dropped in all our analyses the 204 respondents (1% of the sample) who are not citizens of their country of residence. Turnout is substantially lower among non-citizens (the gap is 18 percentage points in our sample) in good part because non-citizens (who are citizens of another EU country) have to register for this election since they do not have the right to vote in national elections. They are thus a very special group, in which the determinants of turnout are quite different (Wass et al., forthcoming), and we prefer to focus on the typical situation whereby a citizen has to decide whether to vote or not. 11Table 1 indicates that turnout was lower among women than among men in each of the seven countries (controlling for age and education). The overall gap was 4 percentage points, and it was stronger in France, Austria, and Greece. This is in line with the finding by Soderlund et al. (2011) that women appear to be particularly less prone to vote in European elections. One possibility is that the issues that are dealt with at the European level are perceived to be less salient by women. We are not able to directly test that hypothesis here. But it will be interesting to see whether the gender gap is explained by the three attitudes that will be explored in the next section. Note: marginal effects are calculated holding the other covariates at their respective means. + p < 0.1; * p < 0.05 **; p < 0.01; *** p < 0.001. 12Without much surprise, the better educated are more likely to vote than the less educated. In the overall pooled sample, the gap between the two groups (after controlling for age and gender) is 13 percentage points. As expected, education is a more powerful determinant than gender. The pattern is the same in each of the seven countries, though it is particularly strong in Germany and Austria and relatively weak in Portugal, Greece and Spain. 13There is some similarity with the patterns established by Gallego (2015, Figures 1-4) who examines the degree of unequal participation in national elections in 85 elections across the world. More specifically, Germany also stands out in her analysis as a country with strong inequality and Spain as one of the least unequal. Gallego attributes these differences in good part to the simplicity/complexity of the voting procedure. Spain has a simple voting system in which people vote for a closed list while Germans have two separate votes on for a local candidate in their constituency and one for a party list6. The German system for the European elections is much simpler (closed PR list) and so the same explanation does not apply here. 14Table 1 confirms, finally, that the propensity to vote increases with age (see also Figure 1 for an illustration). 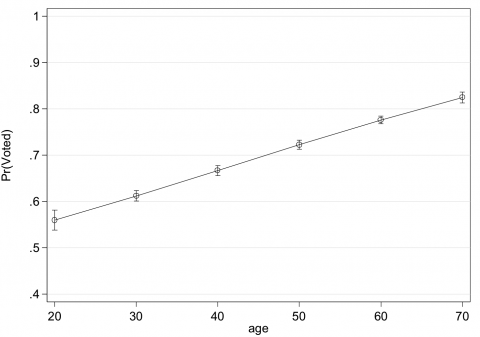 All in all, in our pooled sample, turnout is 16 percentage points higher at age 50 than at age 20. Surprisingly, there is no clear evidence of a curvilinear pattern, however, whereby turnout declines after a certain age. We would not put too much emphasis on this, as the internet survey may not be as representative of the older segment of the population. 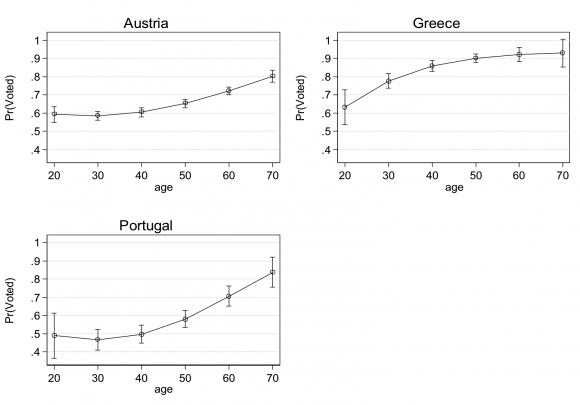 What is clear, however, is that in each country, those aged 50 or 60 are much more likely to vote than those aged 20. 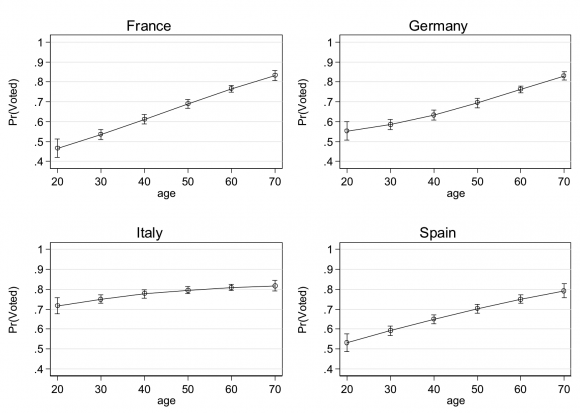 Interestingly, the only country where the relationship with age is weak is Italy (Figures 2, and 3)7. 15In a recent study Bhatti et al. (2012) show that the relationship between age and turnout may be more complicated than usually assumed. More specifically, their data indicate that turnout is actually relatively high at age 18 and declines between 18 and 20 before starting to rise again. We do observe in our pooled data set, however, that turnout is very stable between 18 and 24, hovering around 60%8. The increase in turnout appears to start only from 25 years on. 16Age and education are therefore relatively strongly correlated with the propensity to vote in the European election. In the case of age, perhaps the most striking result is that the increase in turnout seems to start only at about 25 and there is no clear pattern of decline at older age though this may reflect the lack of representativeness of our sample among the oldest fraction of our sample. Finally, it seems that the traditional gender gap (women being less likely to vote) has not completely disappeared in European elections, though it should be stressed that this gap is quite modest. Note: predicted probabilities are based on the regression model from Table 1. Note: Predicted probabilities are based on the regression models from Table 1. 17There are of course some cross-national variations in these relationships between socio-demographic characteristics and turnout. 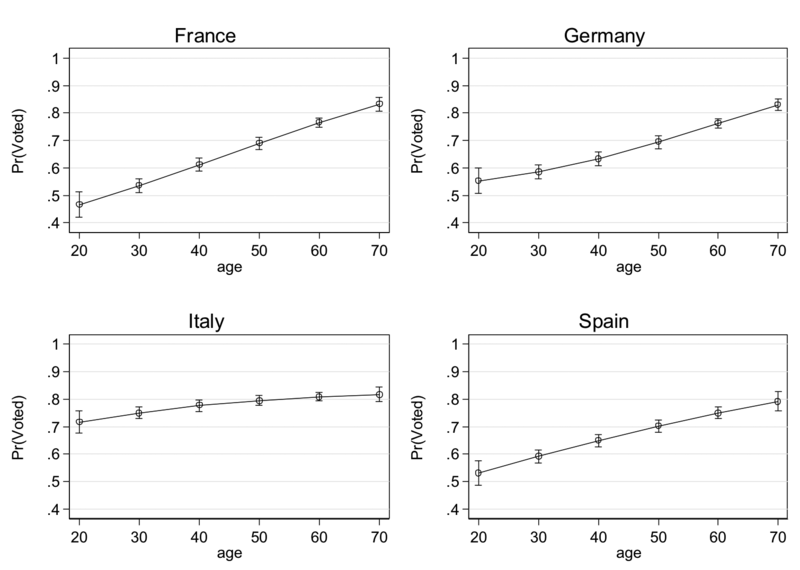 As mentioned above, age is a weak predictor of voting in Italy, education is particularly strongly correlated with turnout in Germany, and gender plays a greater role in France and Austria. These differences, however, are relatively minor, relative to the common patterns that emerge everywhere. Furthermore, there is no evidence of a “North” versus “South” or original versus more recent member state cleavage. 18It is useful to know who is most and least likely to vote but it is also important to understand why. In this study, we focus on three potential attitudes that may lead people to abstain. The first is lack of political interest. According to Brady et al. (1995) one’s general level of interest in politics is the most powerful predictor of the decision to vote or not, and we thus include this basic attitude in our model. But we are concerned with participation in a European election and we thus wish to determine whether some Europe-related attitudes also come into play. We have selected two of these attitudes. The first is the presence or absence of a European identity. It is easy to see that those who have no attachment to Europe may see no good reason to vote in a European election. The second attitude concerns one’s evaluation of the performance of the EU as an institution. Many people view the EU as an inefficient institution and may see little use in participating in the selection of representatives in an organization whose contribution to solving concrete problems is deemed to be dismal. Our goal is thus to determine whether each of these attitudes is indeed correlated with the decision to vote or abstain and which is the most influential. 19For the sake of simplicity we have dichotomized each variable. We thus test whether those with relatively high interest in politics (6 or above on the 0 to 10 scale), with a European identity, and with a positive assessment of the EU performance (an average score higher than 5 on the 0 to 10 scale) are indeed more likely to vote. All in all, 59% of the total sample are considered to be interested in politics, 65% have an European identity, and 32% positively evaluate the EU. 20Table 2 presents the findings, which are pretty clear. Perhaps surprisingly, the performance variable is not significant, neither in the pooled data set nor in any of the seven countries. In fact it has even an unexpected negative sign. This suggests that the main reason for the low turnout in the European election is not the perception that the EU is an inefficient institution. That perception does exist but it is not associated with a greater propensity to abstain. + p<0.1; * p<0.05; ** p<0.01; *** p< 0.001. 21The two other attitudes, interest and identity, are clearly significant, and they are significant in every country, with the exception of Greece, where European identity does not appear to matter and the impact of political interest is also particularly weak. The fact that attitudes have so little influence in Greece might be related to the fact that voting is formally compulsory (though without any sanction) in that country. Table 2 also clearly shows that political interest matters much more than interest. Everything else being equal, the probability of voting is 17 percentage points higher among those with relatively high interest. The equivalent effect of European identity is only 8 percentage points. And these effects vary only little across countries (with the exception of Greece). 22These results indicate that the lower turnout observed in European elections may be partly imputed to the absence of a European identity among some citizens. But clearly this is just one factor among many. According to our estimates, turnout would increase by only 3 percentage points (.08 X 35% with no European identity) if everyone had a European identity. 23We may ask whether these attitudes account for the socio-demographic effects documented in the previous section. The short answer is: partly. We can see that the small gender gap completely vanishes when we introduce these attitudes. Additional analyses not shown here indicate that the crucial variable is political interest; this is the variable that “causes” the gender coefficient to become insignificant. The proportion of politically interested is only 52% among women, while it reaches 67% among men. Political interest is also an important reason why the better educated are more likely to vote but the educational gap remains substantial even after controlling for interest and identity. And finally the impact of age is largely unaffected by the inclusion of these attitudes. Clearly other factors would have to be considered in order to explain the impact of age and education. 24Lastly, we may wonder whether there is an interaction effect between political interest and EU identity. There are two possibilities. The first is that EU identity compensates for the lack of interest. If it were so, the presence of EU identity would matter most among those least interested, and thus the interactive identity X Interest variable would have a (significant) negative coefficient. Or, contrarily, EU identity could be “required” in combination with political interest. If it were so, the presence or absence of EU identity would have the greatest impact among the most interested, and the identity X interest interaction would have a (significant) positive coefficient. Note: + p < 0.1; * p < 0.05; ** p < 0.01; *** p < 0.001. 25We test these two hypotheses in Table 3. We can see that the findings confirm the second hypothesis, with a significant positive interaction effect. This positive interaction effect emerges in each of the seven countries except Spain. This indicates that a sense of European identity hardly compensates for the lack of political interest. It is rather that it helps a lot to have both political interest and some attachment to Europe; the combined impact of these two attitudes is greater than the addition of their individual independent effects. 26We have examined the socio-demographic and attitudinal correlates of the decision to vote or abstain in the 2014 European elections in seven countries. Many of the findings replicate patterns that have been observed in national elections. Turnout increases with age and education, and it is strongly correlated with one’s general interest in politics. Turnout is lower in European than in national elections, for many reasons that we have not been able to examine in this paper, the most obvious one being that the European Parliament deals with issues (such as regulation) that are less salient to most citizens than the issues debated in national parliaments. Nevertheless, the European election is… an election, and the usual factors that come into play in citizens’ willingness to vote in a national election are also at work in the European elections. 27That being said, there are some distinctive patterns. Contrary to what we observe in national elections, there is a small gender gap, women being more prone to abstain, which is essentially due to their lower interest in politics. This suggests that lack of interest is more crucial for participation in elections of low salience (the European ones) than in those of high salience (the national ones). We also see that those who feel no attachment to the EU are less prone to vote. It is important to point out, however that this effect is quite small, and does little to explain the much lower participation rate in the EU elections. Similarly, we find that evaluations of the performance of the EU with respect to a host of issues do not appear to have an independent effect on the turnout decision. Among other things, these results imply that, those who wish to counter the declining voter turnout trend in European elections should not invest too much effort in transforming European citizens’ attitudes and perceptions through (pro-European) political marketing. Instead, a more efficient strategy will be to increase the salience of European elections in the eyes of both voters and political parties. 28Finally, we are struck with the lack of cross-national variation in the determinants of turnout. The patterns that we have uncovered are amazingly similar across each of the seven countries included in our study. For instance, education is positively correlated with turnout in each of the seven countries, political interest matters more than EU identity in every country, evaluations of the EU performance do not have a positive effect in any country, and there is a positive interaction effect between identity and interest in every country except Spain. 29There are of course some exceptions, but they appear mostly idiosyncratic. There is no evidence of a North/South cleavage nor is there is evidence that the factors that affect turnout are any different in the countries democratized and/or joined the EU earlier. Whether one votes or not seems to depend very much on the usual suspects: how old the person is, how educated she is, and how much (or little) interest in politics she has. Bhatti Yosef, Hansen Kasper M., Wass Hanna, 2012, “The Relationship Between Age and Turnout: A Roller-Coaster Ride”, Electoral Studies, 31-3, p.588-593. Birch Sarah, 2009, Full Participation: A Comparative Study of Compulsory Voting, Manchester, Manchester University Press. Blais André, 2000, To Vote or Not to Vote? The Merits and Limits of Rational Choice Theory, Pittsburgh, University of Pittsburgh Press. –, 2007, “Turnout in Elections”, in The Oxford Handbook of Political Behavior, Hans‑Dieter Klingemann and Russel J. Dalton (eds), Oxford, Oxford University Press, p.621-635. –, Gidengil Elisabeth, Nevitte Neil, 2004, “Where Does Turnout Decline Come From?”, European Journal of Political Research, 43-2, p.221-236. Brady Henry, Verba Sidney, Schlozman Kay L., 1995, “Beyond SES: A Resource Model of Political Participation”, American Political Science Review, 89-2, p.271-294. GALLEGO Aina, 2015, Unequal Political Participation Worldwide, New York, Cambridge University Press. Nevitte Neil, BLAIS André, Gidengil Elisabeth, NADEAU Richard, 2009, “Socioeconomic Status and Nonvoting: A Cross-National Comparative Analysis”, in The Comparative Study of Electoral Systems, Hans-Dieter Klingemann (ed. ), Oxford, Oxford University Press, p.85-108. Norris Pippa, 2002, Democratic Phoenix: Reinventing Political Activism, Cambridge, Cambridge University Press. PERSSON Mikael, 2004, “Testing the Relationship Between Education and Political Participation Using the 1970 British Cohort Study”, Political Behavior, 36-4, p.877-897. SODERLUND Peter, WAAS Hanna and BLAIS André, 2011, “The Impact of Motivational and Contextual Factors in First- and Second-Order Elections”, Electoral Studies, 30-4, p.689-699. TUORTO Dario, BLais André, 2014, “Angry Enough to Abstain? Turnout, Political Discontent and the Economic Crisis in the 2013 Elections”, Polis, 28, p.25-36. WASS Hanna, BLAIS André, MORIN-CHASSÉ Alexandre and WEIDE Marjukka, “Engaging immigrants? Examining the correlates of electoral participation among voters with migration background”, Journal of Elections, Public Opinion, and Parties, [forthcoming]. Wolfinger Raymond E., Rosenstone Steven J., 1980. Who Votes?, New Haven, Yale University Press. 1 Turnout is measured by the following question (Q6): “Many people did not vote in the European election held on May 25 2014. And you did you vote?”. There were four response categories: 1. I did not vote in the European election; 2. I thought about going to vote but in the end I did not go; 3. I usually vote but I did not vote this time; 4. I am certain to have voted in the European election on May 25. The first three categories were coded as abstention and the fourth as turnout. 2 Note, however, that the relationship may be even more complex, as there is evidence that between 18 and 21 turnout appears to decline as many people leave the “family nest” (Bhatti et al., 2012). 3 Political interest is measured by the following question (Q18) : “Are you interested in politics?” (with a 0 to 10 scale, 0 meaning not interested at all and 10 very interested). 4 Attachment is measured by the following question: “Do you see yourself as [country of citizenship] [country of citizenship and European] [European and country of citizenship] [European]?” Those who see themselves at least partially as European are coded 1. 5 Evaluation is tapped by the average score on the following question measuring the perceived performance of the EU on five issues in the country of residence (unemployment, the tax burden, public debts and deficits, immigration, climate change): “Do you think European Union policies have had a positive influence or no influence on…” (with a 0 to 10 scale, 0 meaning an extremely negative influence and 10 an extremely positive influence). The respondents are coded 1 if the average score for the five questions is higher than 5 (i.e. positive). 6 The low degree of inequality in Greece does not fit this explanation, as the Greek voting system is very complex. Greece, however, is formally a compulsory voting system (which does contribute to lower inequality), though there are no sanctions for abstention (see Birch, 2009, p.36). 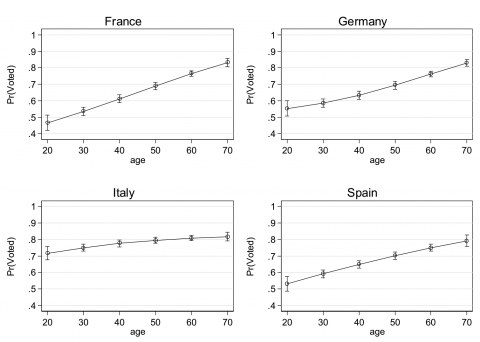 7 Tuorto and Blais (2014) report that in the last Italian national election, the reported turnout of the 18-34 age group is only six points lower than that of the 35-54. 8 Note that age is measured by year of birth and corresponds to the difference between that year and 2014, and is thus overestimated by one year for all those born after May 25.